I also want to let you know that each week I visit every blog. If it appears I haven't visited your blog by Wednesday afternoon, please let me know! Please release your "R" link now. Class is dismissed. Be back in a bit with my post. Take care. Oh goodness! I think my boo-boo a few weeks ago, when I was posting for the letter "P" post when it was actually the week for the "O" post, was actually a good thing for me! Cuz since then, I have somehow been able to get my posts together a little bit early, instead of squeaking in to "class" at the end of the line...or knocking on your door with my infamous request to "please let me in?" Yahoo! Yippee! I am so excited! R and I go way back. I guess I was supposed to put R is for Rock...lol...I'll do better next time. I will be visiting after I walk new dog. I haven't been by for a while as I really lost my blogging mojo due to all the things going on over in our part of the world. I have posted a few things this week though, and since I posted about my friend Rebecca today I thought I would get back into Alphabe Thursday! Jenny, I love this party! All week I had so many subjects with R and a special one that I just did not get posted. Maybe I will still try to incorporate it by using another letter still left in the alphabet. When the alphabet is finished, do we start over agin with A, or do you have someting new? I'm already planning my alphabet ahead of time. Hi Jenny! Thanks for the riot. See ~ I am keeping up with the R theme!! 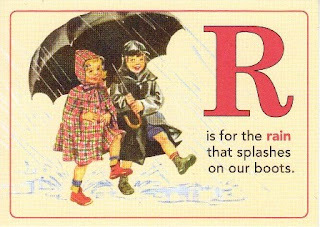 R is for nearly REACHING the end of our second alphabet series. Will we be RESTING next or RESUMING play in another ROUND? I'll be looking forward to READING your decision! Thank you for the kind words on my blog! Made my day! And thanks for allowing me to stretch my imagination! It feels great! I hadn't "seen" you for a while and I just wanted to stop and tell you that I was thinking of you:) I hope your week is going well. Oh no! I didn't have a chance to visit the links until now. But there are no links to visit! All the links are gone. I hope it's just a glitch and not that Mclinky left us for good! S is for Mo's Sweet Heart Braids! Well...Happy VD and all that mushy stuff! Buy stock in Pillsbury now!